The client’s brief proposed that the form, scale and overall visual appearance of the house had to evolve from its rural and coastal environment setting. Within this, their principal aim was to create an inspirational home for their children to grow up in, where daylight, nature and the elements, tangible materials and textures, spatial interaction and energy awareness would be ever present. This is a suprememely energy efficient building that combines a number of key products from the kingspan range including the Tek Building System, Thermomax solar vacuum tubes, heat recovery ventilation system and rigid insulation throughout. 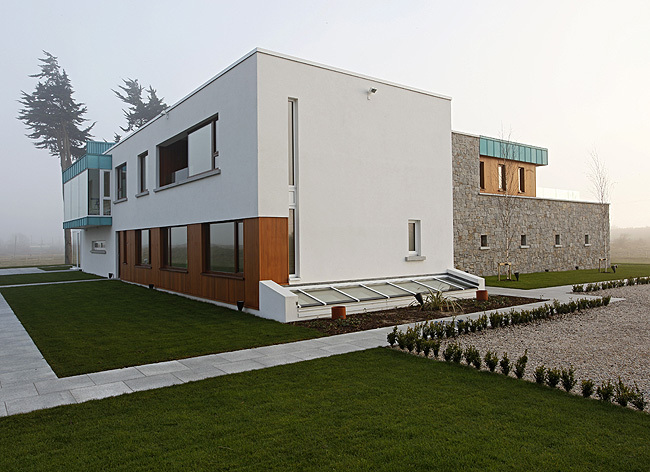 Also incorporated is a Eurotech geothermal heating system, an air to water heat pump and a Eurosmart control system which uniquely gives preference to the highest energy efficient preformer at any given time of day. These together with triple glazing throughout, all combine to make this A rated dwelling, including its indoor pool, extremely economical to heat.